Keys, Guitar, Harmonica, & Vocals for RCA Recording Artist Jake Owen. Joe began his musical adventure at age 6, playing piano in his family’s gospel quartet. He then taught himself the guitar at age 12. By his teenage years, he had played around the country in various bands, playing various instruments. He moved to Nashville in 2004 and started touring with national acts in 2005. 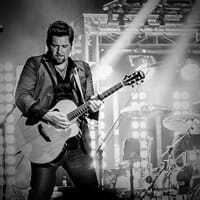 Since then he has worked with several artists including Josh Turner, Florida Georgia Line, Chuck Wicks, Hunter Hayes, Julianne Hough, Ray Scott, Danielle Peck, and is currently touring with Jake Owen. You can see and hear Joe play McPherson guitars with Jake Owen on Kenny Chesney’s Big Revival Tour.